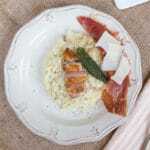 Lay a sage leaf on the breast of each quail and wrap with a slice of Prosciutto di San Daniele. Tie the quails up with string and season with salt and pepper. Heat some olive oil in an ovenproof pan and brown them on all sides. Turn each quail on its back and transfer the pan to the oven. Roast for about 4 minutes, then take the quails from the pan and leave them to rest in a warm place for about 8-10 minutes (breast downwards, so that the juices keep the breast meat moist). After soaking in the flavours of the Prosciutto di San Daniele, both the sage leaves and Prosciutto di San Daniele can be removed. Remove the legs and wings and put them to the side. Then slice each breast into 4 ready to garnish each plate of risotto. Heat the stock with the quail carcasses and bring to a simmer. Melt the butter in a heavy-based pan and add the onions. Cook gently for approximately 5 minutes until softened, but not coloured. Add the rice and stir ensuring that all is coated in the butter to ‘toast’ the grains. Once the rice is evenly coated and hot, add the wine. As soon as the wine has evaporated, start to add the stock a ladle or two at a time, continuing to stir thoroughly. When each addition of stock has almost evaporated, add the next ladle. While the risotto is cooking, deglaze the quails’ roasting pan by putting the pan on the hob, pouring in the wine and allowing it to bubble. Scrape the bits from the bottom of the pan, until the wine and juices reduce. After around 9-10 minutes, pick the meat off the legs and wings of the quail add along with the wine juices from the roasting pan into the rice. Carry on cooking for about 7-8 minutes, letting the rice absorb the juices, and adding stock if necessary.